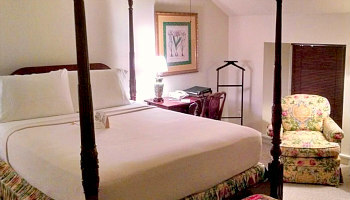 Compact and Romantic, Delaware may not always get noticed, but it’s an ideal getaway for couples in the northeast USA. Whether you’re after a simple romantic beach hotel getaway or a luxury resort with honeymoon suite, it’s easy to find things to do and romantic places in Delaware. Delaware is a particularly attractive spot for romance and travel as a break from some of the bustle of big city destinations nearby (like Baltimore, D.C. and Philadelphia). The Best Time to Visit Delaware: For a romantic vacation is in the spring, the month of May is ideal, and again after summer, late September and October is the best time of year for fall colors and autumn foliage. 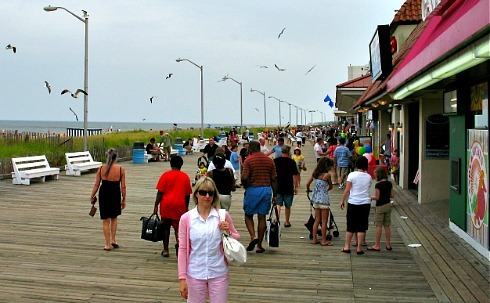 Beach areas near Rehoboth can get very busy in the summer, so plan your trip carefully. They can also get very hot and humid. That's why late spring and autumn are such great times to plan a getaway in Delaware. Winter can be quite cool, and snow can fall, but mostly towards the northern and inland regions. 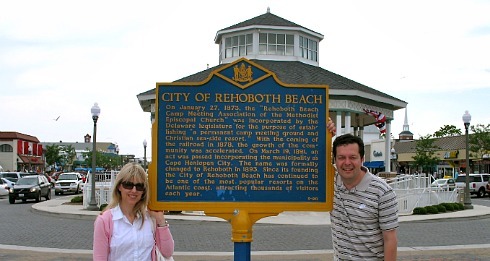 Maureen and I really like Rehoboth Beach - it's a popular Delaware vacation spot, and full of small-town charm, nice beaches and a boardwalk perfect for long strolls by the water. A fun place to explore the downtown is at at Rehoboth Ave, a fun street full of seafood take-aways, ice cream stands and interesting shops. If you're seeking some sand in quieter surrounds (especially in July/August or during school and stat holidays), just follow Hwy 1 south to Bethany Beach or Fenwick Island. Romantic Delaware Vacation Rental Cabins & Beach Houses - rental units for a perfect couples getaway, located in Bethany Beach, Lewes, Wilmington DE and more. The BellMoor Inn & Spa Packages at Rehoboth Beach is a luxury Delaware beach resort with both weekday and weekend spa packages and wellness programs. Suites feature fireplace, wet bar and hydrotherapy tubs, with downtown Rehoboth Beach shops and restaurants just a short walk away. Romantic Dupont Hotel, Wilmington DE - this historic Brandywine Valley Inn gets celebrity stays and great reviews! If you’re planning a Delaware anniversary getaway, they have a package with champagne, dinner for 2 and museum passes. Cheap Romantic Getaways in Delaware at the Holiday Inn Express - Rehoboth Beach - trying to holiday in Delaware on a budget? Holiday Inn Express hotels are excellent places to stay with good value, and this one's in a great location between the beach and the Rehoboth Outlet Stores. Lewes, DE - Just across the bay from Cape May, NJ is Lewes, DE, another romantic Delaware vacation spot. Nice sandy beaches good for swimming and Cape Henlopen State Park are the attractions here. 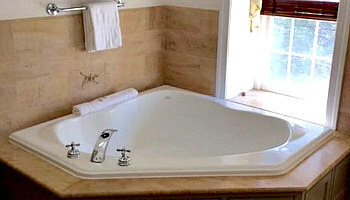 Romantic Lewes, Delaware Accommodation: try the Inn at Canal Square with their Maritime-themed rooms and romantic packages around the Delaware Coast. Brandywine Valley, DE – lovely gardens, mansions and estates highlight this area of Delaware. Dover, DE – numerous museums in this small, quiet city make it the ideal winter weekend getaway in Delaware.